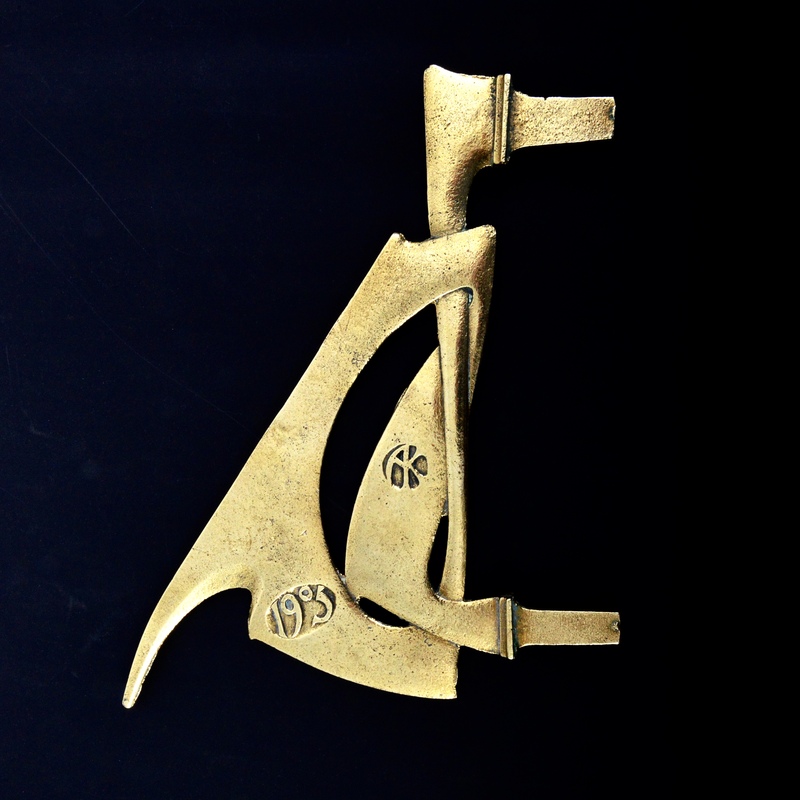 I am delighted to list this sundial pointer / gnomon by Archibald Knox. This gnomon is one of two known and is a product of ‘The Sunnyside Workshops’, Victoria Road, Douglas. This was set up in 1905 by Wilson James Ashburner, a close friend and patron of Knox, ‘to rival in artistic productions the famous workshops controlled by the late Mr. William Morris’. To quote a contemporary newspaper report – ‘Mr. Ashburner is himself an accomplished craftsman and no mean designer, and he is aided in his efforts to revive art in wood and metal work by the designs of Mr. Archibald Knox and the exquisite workmanship of Mr. Joseph Cannell’. Hence the monograms on the gnomon are ‘AK’ – Archibald Knox, ‘JC’ – Joseph Cannell and ‘WJA’ – Wilson James Ashburner. Documentation related to the other known gnomon suggests it was cast by William Knox, Archie’s older brother who ran the family business. 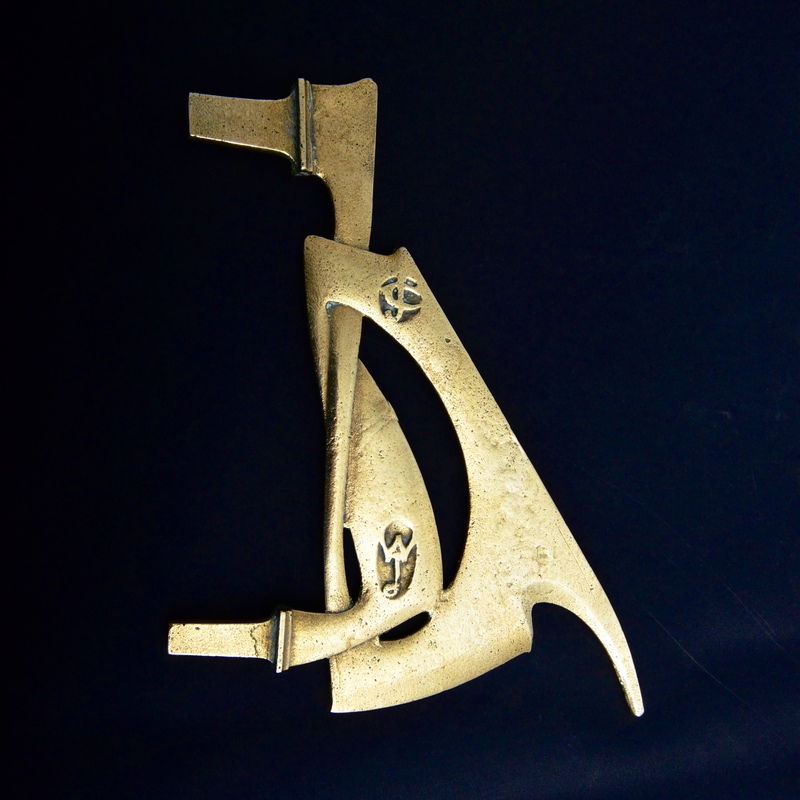 The gnomon is in polished bronze and appears never to have been used. It is in excellent condition. It is designed to be hung on a wall vertically. I am indebted to Alan E. Kelly, Mannin Collections on the Isle of Man for the cataloguing of this item. I am also grateful to Dr Stephen Martin and Chris Hobdell of the Archibald Knox Forum for their assistance in researching this piece. An image of this piece will apppear in Dr Stephen Martin’s forthcoming 3rd edition on Archibald Knox.